Also—SARAH JOHNSON, alias MATILDA WELCOME his wife, and child about a year old. Sarah or Matilda is 5 feet 4 or 5 inches high, black complexion and from 28 to 30 years of age. 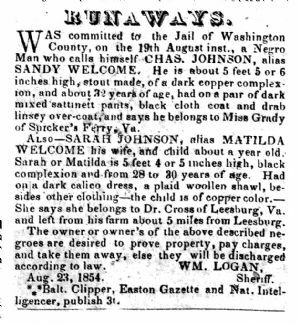 Had on a dark calico dress, a plaid woollen shawl, besides other clothing—the child is of copper color.— She says she belongs to Dr. Cross of Leesburg, Va. and left from his farm about 5 miles from Leesburg. The owner or owners of the above described negroes are desired to prove property, pay charges, and take them away, else they will be discharged according to law. * Balt. Clipper, Easton Gazette and Nat. Intelligencer, publish 3t.